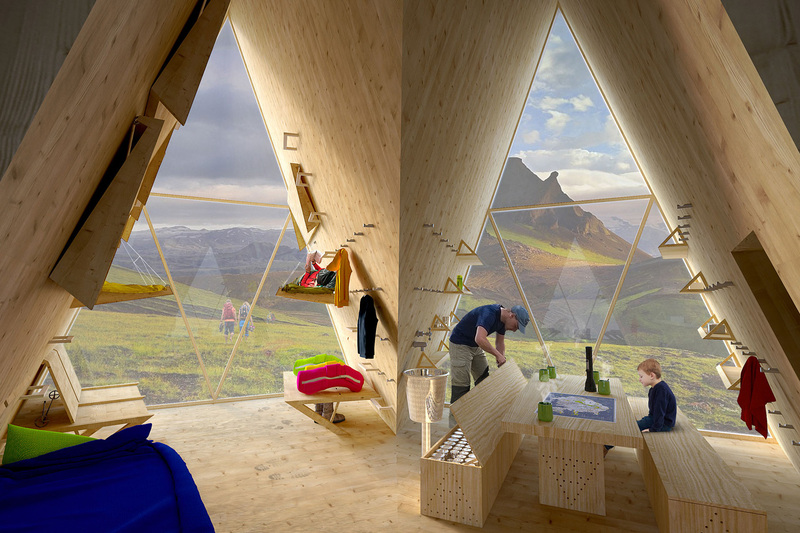 Set along the trails of Iceland, the Skyli Trekking Cabin is a refuge for hikers from the harsh elements. The structure is comprised of four gabled roofs. Although it resembles a tent, this shelter is clad in a steel facade to protect you from the elements. A bright blue color makes it easily visible in the rugged landscape while also paying homage to the architecture of the country’s capital. The interior is lined with cross-laminated timber and features enough fold-out beds for up to 15 people, water, power, and even emergency supplies. Beneath each peak, large triangular windows take advantage of the surrounding scenery. Its prefabricated design allows for materials to be easily transported by helicopter. Once they’re delivered, the assembly can be completed in as little as a couple days.